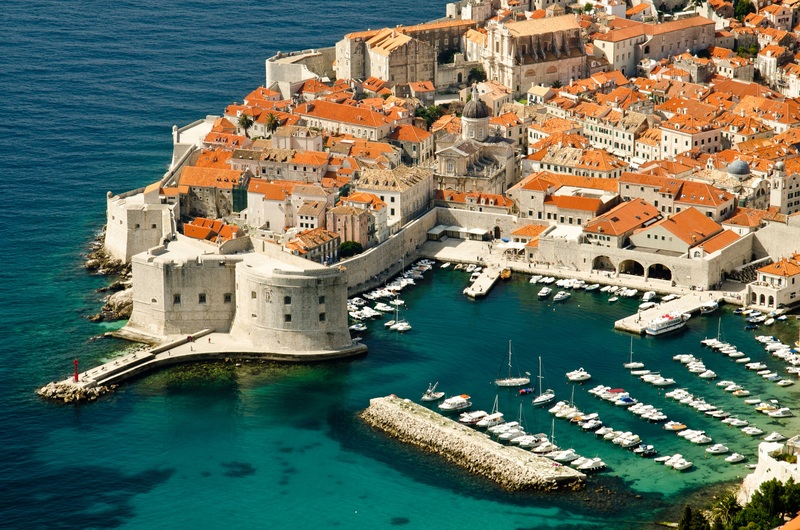 Croatia’s Adriatic Sea mainland coast is 1,777.3 kilometres (1,104.4 mi) long, while its 1,246 islands and islets have a further 4,058 kilometres (2,522 mi) of coastline. The distance between the extreme points of Croatia’s coastline is 526 kilometres (327 mi). The number of islands includes all islands, islets, and rocks of all sizes, including ones emerging only at low tide. The largest islands in the Adriatic are Cres and Krk, each covering 405.78 square kilometres (156.67 sq mi); the tallest is Brač, reaching 780 metres (2,560 ft) above sea level. The islands include 47 permanently inhabited ones, the most populous among them being Krk and Korčula. The shore is the most indented coastline in the Mediterranean. The majority of the coast is characterised by a karst topography, developed from the Adriatic Carbonate Platform. Karstification there largely began after the final raising of the Dinarides in the Oligocene and Miocene epochs, when carbonate rock was exposed to atmospheric effects such as rain; this extended to 120 metres (390 ft) below the present sea level, exposed during theLast Glacial Maximum’s sea level drop. It is estimated that some karst formations are related to earlier drops of sea level, most notably the Messinian salinity crisis. The eastern coast’s largest part consists of carbonate rocks, while flysch rock is significantly represented in the Gulf of Trieste coast, on the Kvarner Gulf coast opposite Krk, and in Dalmatia north of Split. There are comparably small alluvial areas of the Adriatic coast in Croatia—most notably the Neretva river delta. Western Istria is gradually subsiding, having sunk about 1.5 metres (4 ft 11 in) in the past 2,000 years. In the Middle Adriatic Basin, there is evidence of Permian volcanism in the area of Komiža on the island of Vis, in addition to the volcanic islands of Jabuka and Brusnik. Earthquakes are frequent in the area around the Adriatic Sea, although most are too faint to be felt; an earthquake doing significant damage happens every few decades, with major earthquakes every few centuries. There are no available yacht for this location, time and/or date you selected.